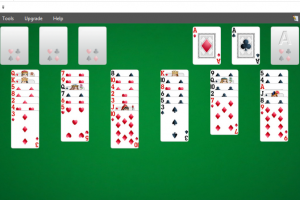 Multiple solitaire styles: classic, pyramid, flower and more"
One of the first and most popular card games is Solitaire because is funny and was included by default in many Windows versions. Since then, were released many versions like this one. 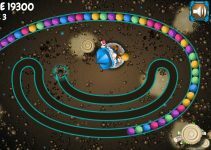 The 123 Free Solitaire is a logical evolution of great old solitaire game which can be played for long hours. 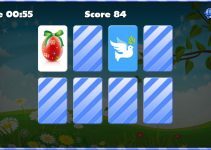 This game is more than one game, it includes different types of the solitaire games as Spider, Diplomat, Eighteens, Flower garden, Grandfather’s clock, Free cell, Pyramid, Spider One and more. 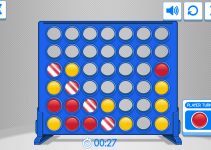 This game is easy to play. 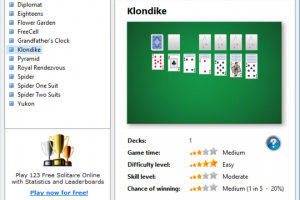 After launching game, you will be presented with menu for selecting which of the solitaire you want to enjoy. Simply select game and get started. It allows saving the progress so you can resume it later. It includes different designs for cards and you can use a custom background image. 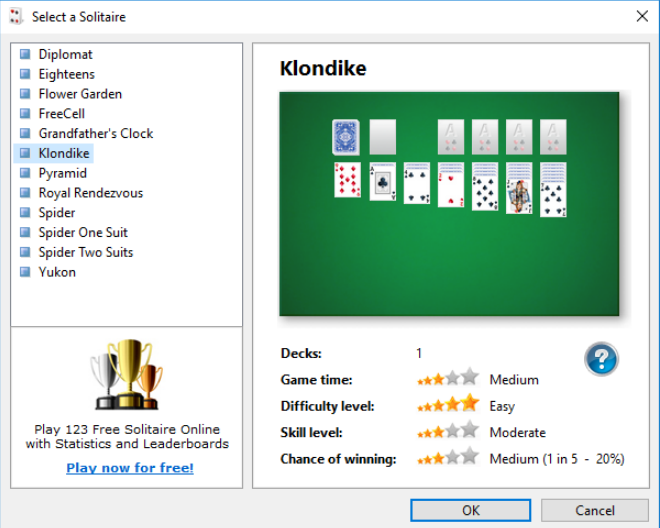 123 Free Solitaire is licensed as freeware for PC or laptop with Windows 32 bit and 64 bit operating system. 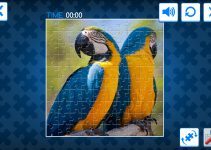 It is in cards category and is available to all software users as a free download.